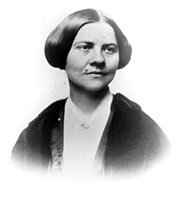 Lucy Stone was an American reformer who did not believe that men should be dominant over women. She lived during the 1800s. Her father would not allow her to be educated, so she took that matter into her own hands and went to Oberlin College, where she became the first woman to graduate. Stone was also the first woman in America to keep her maiden name after being married. Stone lived in a time when wealthy, white men were the only predominant figures in society, and therefore, they were the only ones who could even possibly be considered heroes. However, at the same time, some women and slaves still may have considered Lucy a hero, because she fought for their rights. Lucy Stone contributed to society in many ways. She toured the country, lecturing against slavery and advocating equality for women. She helped organize the first national women's rights convention, held in Worcester, Massachusetts in 1850. Her main focus was women's rights, and she mostly fought for this through legislation. Stone and her husband were in charge of Women's Journal, which was an effective forum for their women's rights views. Lucy Stone stood for perseverance, courage and ambition. She had a goal in mind, and that was to get equal rights for women. Although that goal was not realized during her lifetime, she definitely went for it; she jumped right in and pushed towards women's equality. Stone was undeniably courageous because she gave speeches against slavery and for women's rights in a time when most people, especially white males were opposed to her views. She was ambitious enough to get her own education and do something with her life that would better the lives of future generations. I really admire Lucy Stone because she was so determined to overcome the view that men were dominant over women. She was not afraid to step out of a society-made box and voice her opinion. She stood up for what she believed in - she would not get married unless her husband allowed her to keep her maiden name. She fought for what she felt was the right thing, and she did not give up if there were obstacles in her way. People would often harass her at her speeches, but that did not make her quit. She really was an astonishing lady. Lucy Stone - Short biographical note about Lucy Stone, as well as some excerpts about Stone by her daughter. About Lucy Stone - A little bit about Lucy Stone and several links to other Lucy Stone websites. Lucy Stone - Another biography on Lucy Stone. Stone, Lucy - Biography about Lucy Stone.